The French government has seen the light, and is aligning various policies to ensure that biogas biomethane in France will grow rapidly as a result of a 15 point plan. It was already set to ban all oil and gas drilling in 2040. Given that the nation’s policy on Nuclear Power is very low-profile, and the nation does not have the same wind power resources available as for example the UK the French nation has little choice but to place a much higher reliance on biomass power, especially anaerobic digestion, biogas and biomethane. France is no different from elsewhere in needing to find a way to accelerate the introduction of renewable transport fuels either. The result is that the AD industry can now look optimistically toward growth in Biogas Biomethane in France. 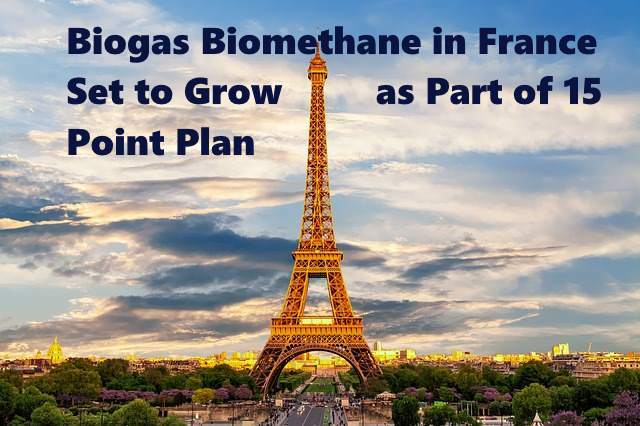 We have included article excerpts below to provide further details of moves in France toward a much greater uptake of Biogas Biomethane in France. Biomethane in France: The French government said it will soon take measures to speed up the deployment of biomethane projects, such as a streamlined approvals process and easier access to project finance, so the country can use 10% renewable gas in its overall gas consumption by 2030. In late March, France’s ecology minister Sébastien Lecornu presented 15 proposals that are likely to form the basis of a detailed plan to roll out biomethane production to farms across France and use the resulting gas in power generation, heating and road transport. The proposals draw heavily on a government-commissioned policy paper presented last month by France Biomethane, a lobby group for the sector, and plans to dismantle a series of bureaucratic hurdles that have so far prevented fast growth in biogas production. The 15-point plan aims to scale up public support for the sector, and lay out the regulatory framework for the use of biogas in road transport. Reliance of biomethane in France will not be raised significantly by the following ban, because French oil and gas reserves are tiny. Nevertheless, the following article excerpt does serve to reinforce the fact that the nation is fully committed to rapid decarbonisation, and in the not too distant future will rely on renewable energy. Earlier this month, French utilities company Engie agreed to ditch natural gas as a power source by 2050, opting instead for biogas and renewable hydrogen to fulfill its green goals, according to a Reuters report. HAMBURG, Feb 14 (Reuters) – A German joint venture said on Thursday it plans a series of 20 biogas production plants in France with investment totalling 50 million euros ($73.05 million). The plants will largely be built for the food processing industry to produce biogas from food waste, said a spokesman for a consortium partner, German biofuels producer BKN Biokraftstoff Nord AG B9KG.DE. “French food processors currently have to pay to remove large amounts of waste materials such as potato peelings, the concept is to turn this waste into biogas and earn profits,” he said. The plants would have a capacity of at least 500 megawatts annually. The first was likely to be completed in one to two years depending on planning approvals being granted by French authorities, he said. A new joint venture company France Biogaz Valorisation has been established by German firm Biostrom Energy, a unit of BKN, plus German renewable fuels investment company Beteiligungsgesellschaft Erneuerbare Energie and development company Sterr-Koelln. Biogas is largely methane produced by processing organic and vegetable materials such as maize, silage or farm animal manure. Conventional gas is produced from fossil fuels such as coal. The consortium will plan and develop projects and organise investment, with finance being provided by institutional investors and food processors. The venture expects rising biogas demand in France, especially because of government moves to compel more renewable energy use. It says France’s biogas market is underdeveloped compared to Germany, where thousands of farmers have built small plants to generate extra income. The above is further evidence of the roll-out of biomethane in France. The Global Wet Waste Management Market is growing with the rapid pace. According to a recent study report published by the Market Research Future, The global market of Wet Waste Management will grow at a rapid pace over the forecast period. The market is forecasted to witness slow but steady growth by 2027, which will be a surplus growth at a moderate CAGR during the projected period (2016 -2027). Wet waste refers to the organic waste, usually heavy due to dampness. Wet waste can be segregated as biodegradable and non-biodegradable. Wet waste management is the process of composting the waste for use as manure, biogas etc. The global wet waste management market is majorly driven by the rising awareness for wet waste management. The market is also driven by the introduction of new wet waste management technologies such as the waste to energy solutions. Awareness for environmental sustainability and increase in the use of eco-friendly fuels in the residential and commercial segments, are contributing to the growth of the market. Rise in government initiatives for spreading wet waste management awareness, is further expected to propel the market growth. However, the growth of this market is restrained by lack of participation from industries and sectors such as commercial, food & beverage, and healthcare. Lack of treatment plants and landfill sites is also projected to hamper the growth of the global wet waste management market over the forecast period. 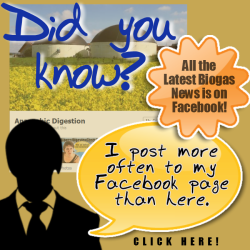 Food waste is processed vie Anaerobic Digestion to produce sustainable energy. This is a natural process where plant and animal materials (biomass) are broken down by micro-organisms in the absence of air. Naturally, occurring micro-organisms digest the biomass which releases a methane-rich gas that can be used to generate renewable heat and power. This helps cut fossil fuel use and to reduce greenhouse gas emissions. The essence of the wet waste management industry has emerged to become much more than just removing waste. The organic waste is segregated from non-recyclable and inorganic waste. This allows cities to make use of organic waste to create compost for public areas. There are even some cities that package and sell the compost to make money. Très bon blog. Je vous remercie. La puissance du biogaz n’est qu’une façon de produire de l’énergie renouvelable. Vous pouvez envisager d’obtenir des chauffe-eau solaires pour chauffer votre eau. Si vous êtes dans une région qui ne doit pas s’inquiéter des températures de congélation, vous pouvez obtenir un système qui fera circuler l’eau à travers un chauffe-eau solaire avant de le pomper dans votre maison. Cependant, vous devriez toujours avoir un chauffe-eau traditionnel comme appoint pour les périodes où le soleil ne sortira pas ou si vous allez utiliser beaucoup d’eau chaude. We like your commenting but please only comment in the English language, in future. I have been following this article, so can you please send me a list of french companies who do this work.